Questions were being asked about the portrayal of woman in Warhol's films before Women in Revolt was released. In a press conference in Berlin for Trash (the previous film directed by Morrissey for Warhol) one journalist even brought up the subject of Valerie Solanas. Bob Colacello was in attendance and later recalled the press conference in an issue of the Village Voice. Once again a press conference and luncheon, this one distinguished by a rising stallion carved of butter as the centerpiece of the standard buffet of herring and hams and by a particularly strident group of women journalists determined to pin evasive Paul and quiet Andy down to some concrete statements of intent and meaning. As the questions got tenser - "Why do women appear as vamps in your films?" "Why are all women stupid in your films?" "Mr. Warhol, was it also a comedy when you were shot by Valerie Solanis [sic]?" - the sun rose higher and higher, glaring down into the Hilton Roof Garden like a bright inquisitory lamp in a Nazi torture scene out of the some post-war movie. Andy seemed increasingly confused and afraid, trapped, but when it was over, to the surprise of everyone, he asked the most persistent and probing journalist of all, a dramatic old woman in red, for her name and phone number in the event he returned to Germany to make a film. "Me in a film," she shrieked, "but I'm a journalist." "Ohhh, but You're so good" said Andy, affirming his belief that actors are everywhere, that personality is all that matters. 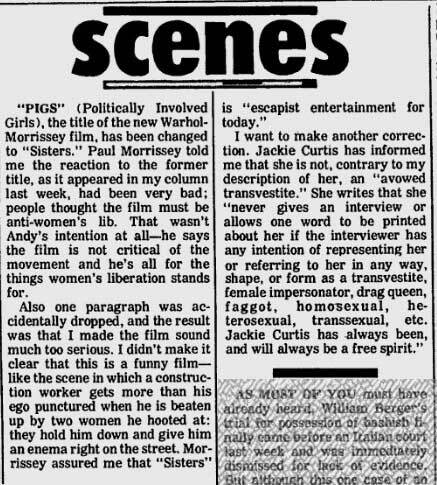 Howard Smith, "Scenes," Village Voice, April 1, 1971 referring to the new film as "Pigs"
Howard Smith "Scenes" Village Voice, April 8, 1971 referring to the new film as "Sisters"
Despite the name change, the acronym PIGS was used in the film as the name of the woman's liberation group that Jackie, Holly and Candy belonged to. The fact that PIGS was an acronym linked it satirically to Solanas' group which was also an acronym - SCUM or the Society for Cutting Up Men. In her biography of Valerie Solanas, Breanne Fahs draws a link between comments made by Solanas in real-life and lines that appear in Women in Revolt. In 1967 Valerie and Andy spent time together at Max's Kansas City musing about things she had on her mind while he held court over his emerging group of superstars. He listened to Valerie's statements and then put some of them into his movies, which infuriated Valerie. "He would give the lines to Viva and Valerie told him to stop it and he kept doing it," a friend recalled. Valerie repeatedly told Andy to stop stealing her lines, but he refused, continuing to to feed them to different - and perhaps more conventionally attractive - female stars he surrounded himself with. Many of her lines appeared in Women in Revolt, clearly without her permission or approval. She often was angry at Andy, but he just shrugged her off, attributing her reactions to eccentricity. Fahs, however, does not indicate which of the lines in Women in Revolt were borrowed from Solanas and the source of her information is third generation - the drag queen editor (Donny Smith) of the underground newspaper DWAN recounting what he was told by Valerie's ex-boyfriend, Louis Zwiren, who was recounting what Solanas originally told him. (p. 343 fn. 82 and 83). Because of her short sentence and her continued presence in the press, she was most likely still in the minds of Warhol and Morrissey when Women in Revolt was being filmed. It's difficult to pinpoint the exact start and end date of the filming. According to Village Voice film critic, Jim Hoberman, at least one of the scenes in Women - the exterior shot where "Jackie and a feminist comrade (Prindeville Ohio) retaliate against a taunting construction worker (Frank Cavestani) by attempting to administer an enema" - was filmed as late as March 1971, although the film first went into production in March 1970. (LT39-41) The July 29, 1970 issue of Variety reported that the film was "already in the can." (LT39). The is a signed release from Holly Woodlawn dated March 1970. (Jim Hoberman, "Women in Revolt: Late, Last, or Post Warhol?," The Late Work of Andy Warhol (NY: Prestel Verlag, 2004), p. 42. There is an advertisement and a review of Trash playing at the Broadview Cinema in Atlanta in the January 4, 1971 issue of an Atlanta underground newspaper called The Great Speckled Bird, but no mention of a public appearance by Holly. (The newspaper was founded by New Left activists from Emory University and members of the Southern Student Organizing Committee, an offshoot of Students for a Democratic Society.) There is, however, an interview with Holly in a later issue of the newspaper - dated March 1, 1971. Holly says in that interview that she is in Atlanta to visit her boyfriend Johnny who lives there. (Johnny played the high school student in Trash whom Holly shoots up with heroin after telling him to trust her - "no needles." They were in a relationship in real-life.) The blurb at the end of the interview says that Women in Revolt has already been "completed." In Holly's March 1971 interview in The Great Speckled Bird, the interviewer begins by explaining that "Holly Woodlawn, the 'drag queen' who played Joe's girlfriend in Trash, was in town last week and Carter and Ron and I went down to the Regency to get an interview." At the end of the interview, referring to Trash, he asks Holly if she made a lot of money from the film. The note about Women in Revolt being completed follows Holly's response to the question. The full interview, with photographs of Holly, can be read here. 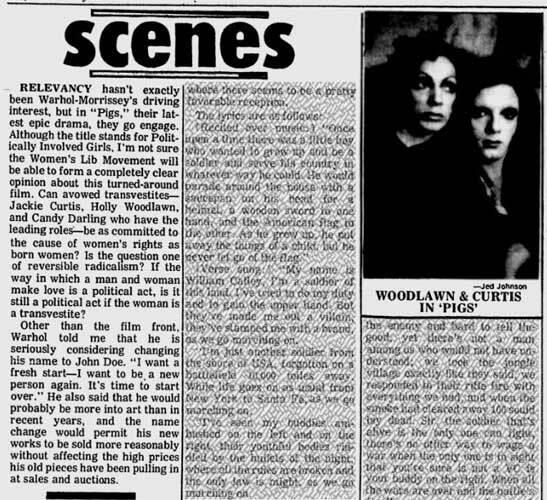 When Jackie Curtis and Holly Woodlawn were interviewed separately by Patrick Smith in 1978, both seemed to claim that Warhol directed the film. In her interview with Smith, Holly says that Warhol turned the camera on during her scenes. Holly Woodlawn: In Women in Revolt, I worked with Andy. He did the filming on that. I remember once he put the film in backwards. It was funny. Patrick Smith: Now, Jackie told me that Jackie insisted that Andy be behind the camera when Jackie's scenes were being shot. Did Paul [Morrissey] stay behind the camera for the rest of the movie? PS: Andy was behind it? Holly has a point. Jackie does appear to be on amphetamine during her interview - one of the drugs she used regularly. In regard to Holly's earlier comment that Warhol turned the camera on during the filming, she may have just been supporting Jackie's "yarn" as best she could. Holly's book was written after Jackie's death and so she (Holly) probably felt freer to speak her mind, without having to worry about contradicting Jackie or causing confrontation. Paul Morrissey has always maintained that he directed the film and, legally, the film is now credited to him as director. Given that Flesh and Trash have also been attributed to Paul Morrissey, it means that three of Warhol's best known "superstars" - Candy Darling, Jackie Curtis and Holly Woodlawn - never actually appeared a film directed by Andy Warhol. 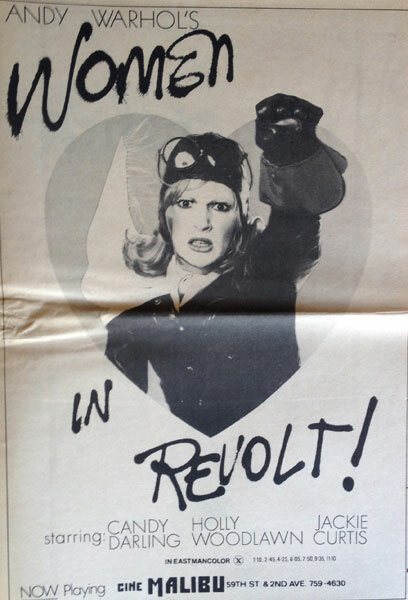 When Women in Revolt opened at the Cine Malibu in New York on February 16, 1972, it was advertised as "Andy Warhol's Women in Revolt." The prominence of Warhol's name probably had more to do with marketing than anything else. Hoberman claims that the film also played L.A. previous to its New York opening. Despite weekly screenings at the Factory all fall of 1971, Women in Revolt still didn't have a distributor. Nobody would touch it, not Cinema Five, not smaller art-film distributors like New World Films; even the Germans were wary. Andy decided to rent the Cine Malibu, a small sexploitation movie house on East 59th Street, and we launched the run with a celebrity preview on February 16, 1972. The women's movement, or at least a small group of women, did demonstrate against the film the day after it opened in New York, according to Bob Colacello. The next afternoon [after the premiere], about a dozen women in army jackets and peacoats, jeans, and boots were outside the Cine Malibu waving protest signs. Vincent [Fremont], who stood beside the ticket booth counting the customers to make sure that Andy Warhol Films, Inc. wasn't cheated, called the Factory to describe the scene, and I called Candy. "Who do these dykes think they are anyway?" she joked. "Well, I just hope they all read Vincent Canby's review in today's Times. He said I look like a cross between Kim Novak and Pat Nixon. It's true - I do have Pat Nixon's nose." Although Canby was kind about Candy, he wasn't so kind about her co-stars, Holly Woodlawn and Jackie Curtis. Canby wrote that Holly is "very funny in short takes, and, in longer ones, so grotesque that it's difficult to watch her." About Jackie, he wrote that she "reminds me a good deal of an Elizabeth Taylor stripped of that fabulous face..." (Vincent Canby, "Warhol's 'Women in Revolt,' Madcap Soap Opera," New York Times, February 17, 1972). In his review, Canby also credits Andy Warhol as the director of the film, with Paul Morrissey the executive producer. After Women in Revolt we had nothing in common except for the press, which was forever linking us together as Warhol's transvestite trio and comparing us to the stars of the Forties. Candy was always compared to Lana Turner because she was the seductive, glamorous blonde! Jackie was the hardened, take-it-on-the-chin Joan Crawford type; and I was the loose, full-lipped chiquita comedienne, which somehow earned me a combined comparison to Phil Silvers and Marlene Dietrich! Ain't that a pisser? As far as I was concerned, I was the next Hedy Lamar and no one could tell me any different! In the eyes of outsiders, we were the Andrews Sisters of the Underground. I would have loved it if it were true, but he fact is after we each attained our Superstardom, we became competitive rivals and couldn't stand one another most of the time."